Nicknamed ‘Kaji’, he led ASU’s basketball, baseball, and freshman football teams at one time or another. RIP. William (Bill) â€œKajiâ€ Kajikawa, a legendary former football, basketball and baseball coach at Arizona State, died Monday morning. He was 97. 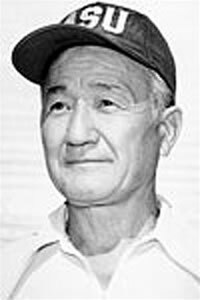 Kajikawa began his coaching career at Arizona State in 1937 and retired in 1978. He began coaching the Arizona State Teacherâ€™s College freshman football team in 1937, when the players were known as the Bulldogs. During his tenure, Kajikawa watched the Bulldogs become the Sun Devils in 1946, and he saw his alma mater gain university status in 1958. Before retiring in 1978, Kajikawa had worked as the freshman football coach under nine ASU head football coaches. In addition, he served as head basketball coach from 1948 to 1957, and he was head coach of ASUâ€™s club baseball team from 1947 to 1957. He was inducted into the Arizona Basketball Hall of Fame in 1968 and the ASU Hall of Distinction in 1982.